BoT Chair (center, in blue) with staff of Abuja Station during the visit. 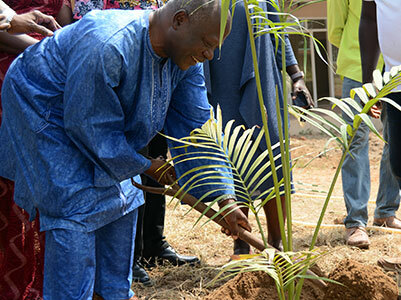 On 15 January, the IITA Board of Trustee (BoT) Chair, Dr Amos Namanga Ngongi, was hosted at the IITA-Abuja Station as part of his visit to the Nigerian capital. He was received by the Head of IITA-Abuja Station, Gbassey Tarawali and the Senior Management Team who gave a brief on the research and delivery activities being coordinated from the Station. In his welcome address, Tarawali outlined the evolution of the Abuja Station from being a research/demonstration farm to a full-fledged experimental research station with 13 resident international scientists. He emphasized its strategic location within the Federal Capital Territory to showcase IITA’s research and development products and the potential to attract support from government and the international community in Abuja. He also appealed for sustainable support to the ongoing infrastructural developments at the Station to enhance the Station’s transformation into a center of excellence for agribusiness and youth development in Nigeria. Tarawali, who is also the Coordinator of the ATASP-1 Outreach Program, highlighted the objectives of the Program and its key achievements noting that at the mid-term review in 2018, the Project had attained its key targets and was adjudged to have done exceedingly well. In his presentation, ATASP-1 Rice Commodity Value Chain Specialist from AfricaRice, Dr Philip Idinoba, highlighted ongoing AfricaRice activities anchored from the Station. He outlined progress made so far in the implementation of the various projects including the successful training of 39,451 farmers, and the distribution of about 65 tons of improved rice seed to rice farmers under the ATASP-1 Program. The work being done on Aflasafe was presented by the West Africa Commercialization and Agribusiness Manager, Peter Okomoh where he highlighted the goals and objectives of the aTTC project. Other presentations were made including from the N2Africa Senior Business Development Advisor, Edward Baars; the Africa Yam Project Leader, Patrick Adebola on the successes recorded so far by the Yam Breeding project; Yam Seed Systems Specialist, Beatrice Aighewi on the rapid multiplication of better quality seed yam under the YIIFSWA-II and CAY-Seed Projects; and Agripreneur Zacchaeus Isuwa who spoke on the IITA Youth Agripreneurs and ENABLE-TAAT project. In his remarks, Namanga Ngongi commended the management of IITA on the rapid transformation that has taken place in Abuja Station. He stressed the importance of partnership and collaboration in achieving the Feed Africa objectives of Dr Akinwunmi Adesina, President of African Development Bank (AfDB) and IITA Director General Nteranya Sanginga. The Board Chair challenged the Abuja scientists to continually innovate to remain competitive and relevant in the development community. The BOT chair appreciated DG Sanginga for establishing the Youth in Agribusiness Program, which he said he once attempted while in AGRA but was not so successful. 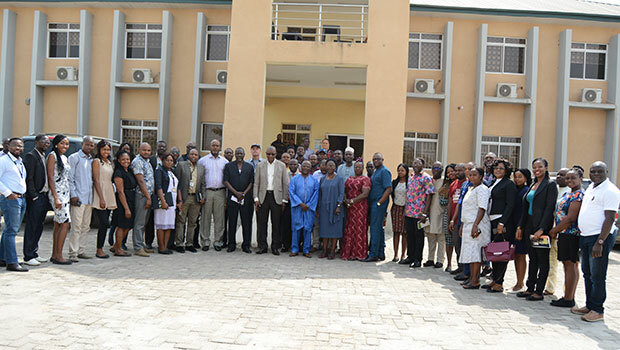 The initiative of IITA management in establishing the Partnership for Delivery Directorate was also lauded by the Board Chair, who insisted that technologies are meaningless until they reach the end users. The Board Chair was accompanied on the visit by Toyin Oke, Head of Resource Mobilization, Protocol and External Liaison (RMPEL) Unit. The visit was capped by a tour of the Station and the planting of a king palm tree in front of the newly constructed Abuja Station Staff Canteen.